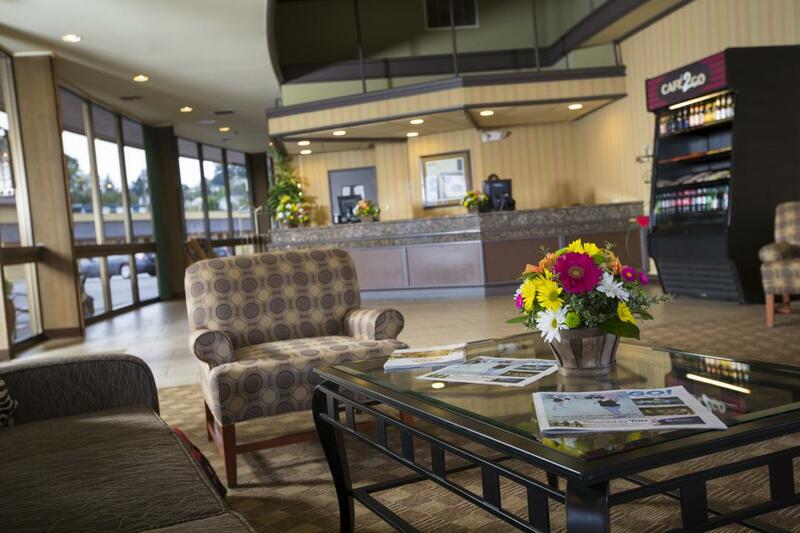 Experience Red Lion's signature blend of comfort and convenience at our Coos Bay hotel. Red Lion Hotel Coos Bay is located off Highway 101 mere blocks from the Oregon shore. 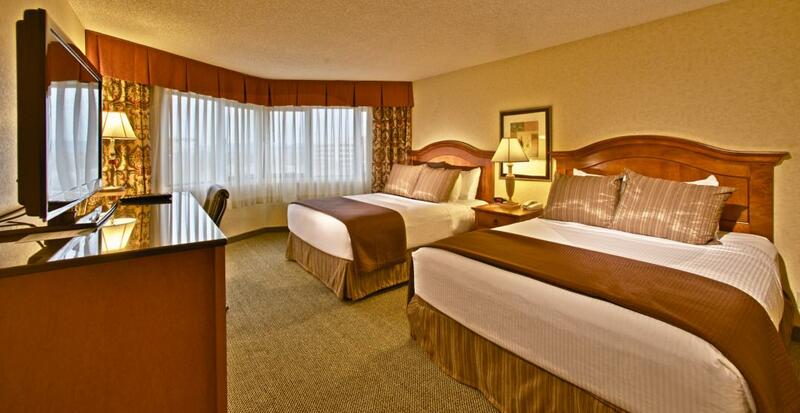 Spread out in comfortable accommodations that feature plush pillow-top beds, complimentary Wi-Fi, and HBO. When your stomach rumbles, Brickstone Restaurant offers delicious dinners and Red Lion's Signature breakfast. After you've satisfied your craving, stop by our seasonal outdoor pool and whirlpool for a refreshing dip. For events and meetings, 5,500 square feet of flexible our meeting space offers the most convenient services of downtown Coos Bay hotels. For any guests arriving at Southwest Oregon Regional Airport, rest assured that our complimentary shuttle runs roundtrip from our hotel. Begin your Coos Bay adventure the best way possible by checking into Red Lion Hotel Coos Bay. We cannot wait to greet you. Get adventurous with exciting water sports, including fishing charters and scuba diving, or simply enjoy a relaxing walk along the shores near our Coos Bay, Oregon hotel. Oregon's famous dunes are the perfect landscape for driving dune buggies and riding ATVs. The Pacific Northwest's natural beauty is all here for the taking. Join us at Red Lion Hotel Coos Bay to enjoy the most thoughtful amenities you'll find along Highway 101. The experience begins as soon as your plane touches down when our complimentary airport shuttle service whisks you away to our cozy Coos Bay, Oregon accommodations. From the moment you enter our lobby you can connect to the complimentary Wi-Fi available throughout the hotel. If you're hungry after a long journey, we offer a delicious dining options onsite at Brickstone's Restaurant. Our hotel in Coos Bay welcomes your pets. Enjoy effortless arrivals and departures with the help of the complimentary airport shuttle service offered by Red Lion Hotel Coos Bay. 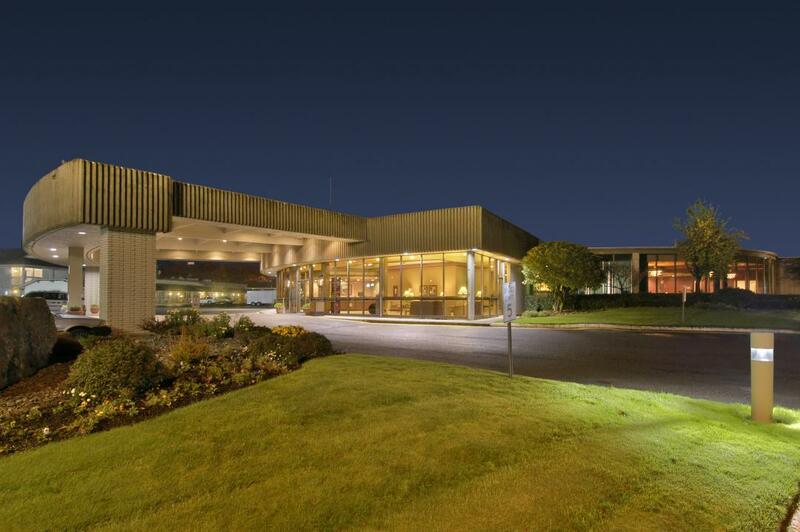 Our hotel's complimentary airport shuttle service travels to and from Southwest Oregon Regional Airport. Our airport shuttle will have you at Red Lion's front door in just ten minutes. We are happy to offer our guests complimentary bicycle rentals. Take a nice ride through Downtown Coos Bay, through Mingus Park, or along the Pacific Coast Scenic Byway, the choice is yours. Visit our front desk for more information on renting a bicycle. We're proud to have been awarded Fido's Favorite for achieving an excellent rating of 4 out of 5 bones from Bringfido.com customers in the last twelve months. 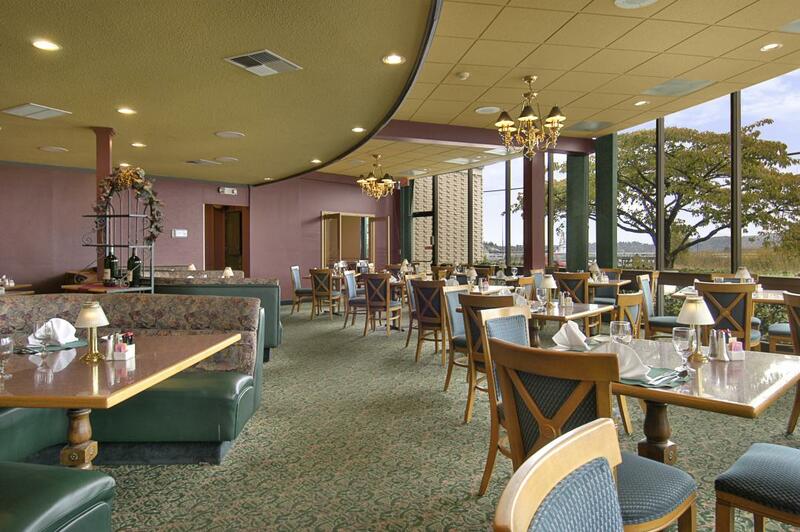 We pride ourselves in providing the best Coos Bay dining options right onsite at our hotel. Rise and shine to Red Lion's Signature breakfast each morning, or grab a quick snack during the day at our convenient Café2Go, located near our lobby. The freshest seafood can always be found at Oregon coast restaurants. 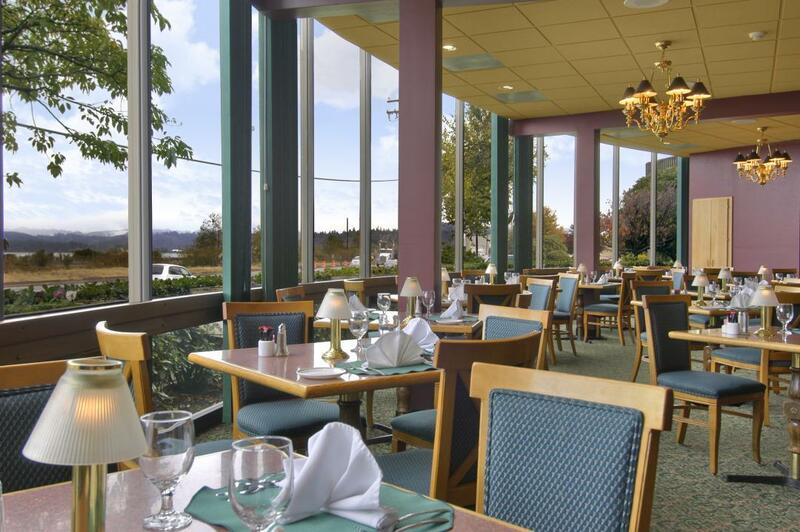 At Red Lion Hotel Coos Bay, we prefer the succulent seafood and classic American fare prepared at our onsite eatery Brickstone's Restaurant. Enjoy classic American fare with a Pacific Northwest twist at this delightful Coos Bay restaurant. Sample a taste of Dungeness crab with our creamy pacific crab melt dip in addition to the array of menu items to choose from. You will not be disappointed. After you've enjoyed the incredible food at Brickstone's Restaurant, sample the cuisine at our staff's favorite Coos Bay restaurants. Enjoy a romantic Italian meal just moments from our hotel on Highway 101. We recommend the minestrone soup and a side of garlic bread, but be sure to make reservations since tables fill fast. Try a local favorite. The Rodeo Steak House & Grill is a great place to have a steak in a great atmosphere with top notch service. Located a few blocks away from the Red Lion Hotel Coos Bay, you will find delectable sandwiches on freshly baked rolls. Try the Gobbler Turkey Sub next time you visit. Seven TVs, complimentary popcorn, and over 20 micro brews make this local lounge the perfect place to spend an evening out. Claim a pool table, put your favorite song on the digital jukebox and make memories with family and friends. Looking for a great atmosphere in Coos Bay? Try Walt's Pourhouse. There are great beers on tap and the food is wonderful. We recommend going when you are looking for a great place to watch a game; Walt's is one of the best sports bars in town. Take a seat to watch the game on four screens or come in on Wednesday for complimentary billiards and Wii. If you're feeling hungry, this family-friendly hangout serves delicious Italian classics including heaping piles of spaghetti and toasted garlic bread. Sample the freshest seafood and other local favorites at this contemporary Coos Bay restaurant. Brickstone's Restaurant is conveniently located right onsite at the hotel and offers a menu that will satisfy your taste buds. From creamy Dungeness crab dip to the hearty halibut fish n chips, you simply won’t find more succulent seafood anywhere in Coos Bay. The restaurant also serves Red Lion’s Signature breakfast each morning so you can enjoy delectable Coos Bay dining in the comfort of your hotel. We believe that caring and creativity are the keys to planning the perfect meeting or event. 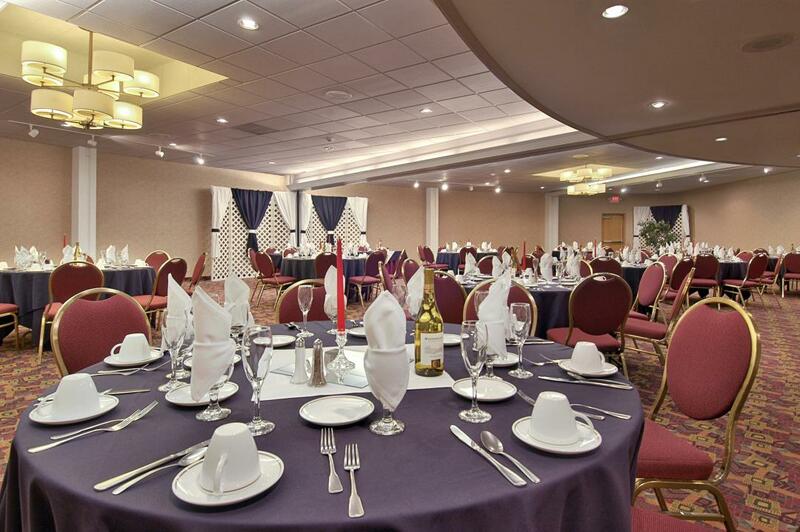 At Red Lion Hotel Coos Bay, our attentive staff will guide you through every step of planning your next meeting or event in our versatile Coos Bay venues. 5,500 square feet of flexible Oregon meeting space includes five well-equipped conference rooms. The largest space is our Umpqua Ballroom, an expansive venue that can accommodate up to 220 people in theater format. Whether you are planning a joyous celebration or an important meeting, the seasoned event planners at Red Lion Hotel Coos Bay will ensure that every detail is attended to. Complimentary Wi-Fi and on-site audiovisual services make for the most efficient conferences in our meeting space in Coos Bay, Oregon. Your guests are sure to appreciate the creative catering options that will please even the pickiest palate. Tantalize your taste buds with the incredible Red Lion Hotel Coos Bay catering services. Our Coos Bay caterers have a passion for serving fresh food that is the star of every event. Your guests will love the breakfast buffet and evening events shine with hand-crafted passed hors d’oeuvres and succulent seafood and steaks. Each dish is as beautiful as our event venues in an effort to create the most memorable experience for you and your guests. We also provide catering to all local events as well including nearby parks, offices and event venues. At Red Lion Hotel Coos Bay, we believe that caring and creativity are the keys to planning the perfect wedding. Our attentive staff will guide you every step of the way through your wedding in our versatile Coos Bay venues. 5,500 square feet of flexible Coos Bay, Oregon event space includes five well-equipped rooms. The largest space is our Umpqua Ballroom, an expansive venue that can accommodate up to 220 people in the theater format. Complimentary Wi-Fi and on-site audiovisual services make for the most efficient receptions. Your guests are sure to appreciate the creative catering options that will please even the pickiest palate. Each and every wedding at Red Lion Hotel Coos Bay is flawless. Begin planning your special day today to discover unsurpassed service and amazing venues. At Red Lion Hotel Coos Bay we recognize the hard work that our local, state and federal government employees provide, which is why we’re excited to offer the per diem government traveler rate at our Coos Bay Hotel. Fueled by government activity, Red Lion Hotel Coos Bay is an ideal Coos Bay location to rest and recharge. For the best government discounts on Coos Bay hotels, look no further. If your agency is traveling as a group contact our Sales Team at (541) 269-4055 or email us at [email protected] today. Terms: Guest must have valid government ID at check in to our Coos Bay Hotel. Active duty/retired military personnel, federal, state & local government, cost contractors, staff of public schools, colleges and universities and employees of foreign governments are eligible for the per diem rates. We are happy to accommodate groups for any type of event. Our catering services here at the Red Lion Hotel Coos Bay are available for all types of events around town; weddings, office meetings, parks, event halls, homes, churches and more. Our Coos Bay professional caterers have a passion for serving delicious food for any event you may be planning. We welcome all sports teams to stay with us at the Red Lion Hotel Coos Bay. We offer great Group Room Rates with many perks for teams. Navigate the area's impressive Pacific Northwest terrain and wander through the many coves graced with panoramic views. Coos Bay tourism provides plenty of excitement for the eyes and mind. We can't wait to share our amazing town with you. Just 20 miles from Red Lion Hotel Coos Bay you'll find Bandon Dunes Golf Resort, a dream course mere miles from the Oregon coast. Bandon Dunes Golf Resort features three Coos Bay golf courses that offer excitement at every turn. Red Lion's convenient location off Highway 101 makes us the perfect choice among Bandon Dunes hotels. Simply pack your putter and head out for a day on the green. Settle yourself on sand dunes 100 feet above the ocean and navigate 18-holes of links-style golf in a natural oasis looking over amazing views. After an intense day on the green, return to Red Lion Hotel Coos Bay for a delicious meal at Brickstone's Restaurant for local fare and drinks. 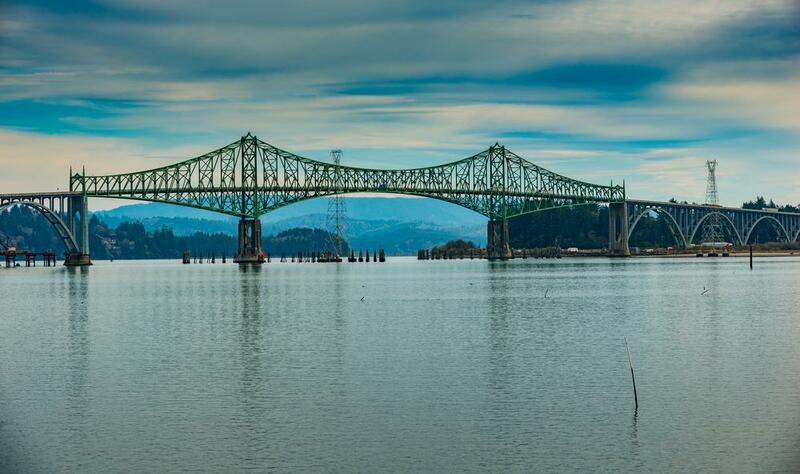 The City of Coos Bay enjoys a beautiful location on the Oregon coast and a rich history, as well as an enchanting downtown to explore during your stay with Red Lion. Settled by shipwrecked Europeans in 1852, the historic city includes such renowned Coos Bay, Oregon points of interest such as the Coos Art Museum, the Egyptian Theatre, and the peaceful surroundings of Mingus Park, all of which are within easy distance of our hotel. Explore some of our favorite Coos Bay attractions below. The city's artistic life is captured beautifully at the Coos Art Museum, a former US Post Office which features 477 permanent collections and rotating exhibitions. Serving the area since 1950, the museum offers everything from juried exhibitions to student art shows, and retrospectives for regional artists capturing the magnificence of the Coos Bay area. Delve into Coos Bay's past at the Coos Historical & Maritime Center, located on Coos Bay's historic waterfront, and discover an immersive walk from the days of the Native Americans to the present. A stellar example of a popular architectural movement of the 1920s, Coos Bay's Egyptian Theatre is the only Oregon movie house that still has its original theatre organ, as well as all its original vaudeville backdrops and working stage. One of the top points of interest in Coos Bay, the Theatre is currently engaged in renovations and fundraising, in an attempt to preserve its unique venue and history, as well as its status as a treasured venue that has drawn the community together for decades. Coos Bay is the place to be for summer festivals that draw visitors from across the world for a taste of the city. Held in the last two weeks of July, the Oregon Coast Music Festival showcases a huge array of genres, including Native American, Celtic, and jazz, as well as a famed orchestra. For arts and craft lovers, the Blackberry Arts Festival in August brings vendors together and offers locals and visitors a chance to sample local arts, crafts, food and entertainment in the historic Marshfield District. All around Coos Bay, drinking and dining abound. The waterfront is home to local favorites like Blue Heron Bistro and Sharkbite's Seafood Cafe. Stretch your legs and soak up the sun with a walk around the winding trails of Mingus Park, relax with a fine meal, and enjoy the charm of one of Oregon's most classic cities. Centrally located in the heart of the Oregon Coast, Red Lion Coos Bay puts you in prime position to explore the area's vibrant, adventurous spirit. But some of the best things to do in Coos Bay can be found indoors, at the region's museums. Art, history, culture, entertainment, and more are on display at these popular museums in Coos Bay, including several museums within walking distance of Red Lion Coos Bay. Located in downtown Coos Bay in the city's former post office. The Coos Art Museum has a permanent collection of contemporary American and Northwest art with several gallery displays of local artists. The museum also hosts several changing exhibitions throughout the year. A must see is The Steve Prefontaine Memorial Collection located on the 2nd floor. For a look at local history, visit the Coos Historical and Maritime Museum located next to Simpson Park on Highway 101 in North Bend. The museum's displays transport visitors back in time to Coos and Coquille Indians' culture and the legacy of the region's first settlers. The Oregon Coast Historic Rail Museum located between the Bay and Highway 101 near Ingersoll Street displays railroad and logging equipment in an outdoor setting. On display is a restored 1922 Baldwin steam locomotive, a sawmill and logging equipment. Visit the museum gift shop for railroad memorabilia. The Marshfield Sun Printing Museum on North Front Street, just a five-minute walk from Red Lion Coos Bay, is a throwback to the old days when an ink-stained newspaper editor could write the story, edit it, set the type and print the page. You'll be able to see the old press which is still operational and look at vintage issues of The Sun Newspaper. The museum features original equipment of The Sun Newspaper (1891-1944) and exhibits on printing and local history. The Coquille Valley museum's collection includes the Lee Peterson tool collection, the Wilkins Photography Studio photographs, Leland Simpson's antiques, and a number of items on loan from the Coquille Sentinel newspaper including a turn-of-the-century printing press and type. The unusual appearance of the Coos County Logging Museum's dome-shaped building has made it a local landmark. The museum features Myrtlewood carvings, antique logging equipment such as chain saws, axes, spring boards, adzes and tools relating to logging. Open from June 1st to September 30th. The Coos Bay Speedway has several exciting events and races throughout the spring, summer and fall. Coos Bay Speedway is located at: 94320 Highway 42, Coos Bay, OR 97420. The Track Hotline is: 541-269-2474. The Red Lion Hotel Coos Bay invites you stay with us while visiting the Coos Bay Speedway. Coos Bay's sheltered waters create one of the best fishing spots in Oregon. Fishing in Coos Bay offers the opportunity to snare one of dozens of diverse species. Salmon, striped bass, halibut, steelhead trout, bottom fish and other species make their homes in the bay. Clamming, berry picking, and camping are also great activities along the bay near the Oregon dunes. For a guided Coos Bay fishing experience, take a charter boat from Betty Kay Charters for deep sea fishing in waters as deep as 200 feet. Betty Kay offers short trips for beginning fishers as well as longer trips for the more experienced fishermen. While you're exploring the wildlife around Coos Bay, make sure to see some of the exotic species in the area. Embark on a whale watching tour, and you can witness Orca, Humpback, and Grey whales in their natural Pacific Ocean habitat. Visit November through May when whale migration is at its peak. These majestic creatures are a must-see for anyone visiting the Pacific waters. Coos Bay's natural beauty and unique wildlife include best outdoor activities. Red Lion Hotel Coos Bay is nestled in the heart of the Oregon adventurous coast. Try your hand at scuba diving or hit the high seas for a chance to spot the majestic humpback whales. However you choose to spend your Coos Bay vacation, you're sure to create memories that will last a lifetime. Discover more than 40 miles of rugged Oregon coastline as you hike or horseback ride along the mountainous sand dunes and beaches. If you're a motorcycle or ATV enthusiast, nearly half the area is dedicated to off-road adventures. You can also enjoy an opportunity to get closer to sea creatures with boating, fishing and scuba diving. From November to May the waters of Coos Bay come alive with the migration of Gray, Humpback, Orca and Sperm Whales. We recommend visiting Shore Acres State Park, Cape Arago State Park, Simpson Reef Overlook and Bastendorff Beach County Park for unimpeded viewing, but local companies such as Miss Linda Charters offer an up close experience with half and full day tours. Sunset Bay State Park offers a serene swimming cove protected by towering sandstone cliffs. Day-use and picnic facilities along the bay provide easy access for swimming, fishing and boating. Shore Acres State offers dramatic ocean views, and its formal gardens showcase a stunning variety of roses and other flora. Cape Arago State Park provides excellent views of migrating whales, noisy sea lion colonies and other marine mammals. Navigate the trails to explore the park's many tide pools. 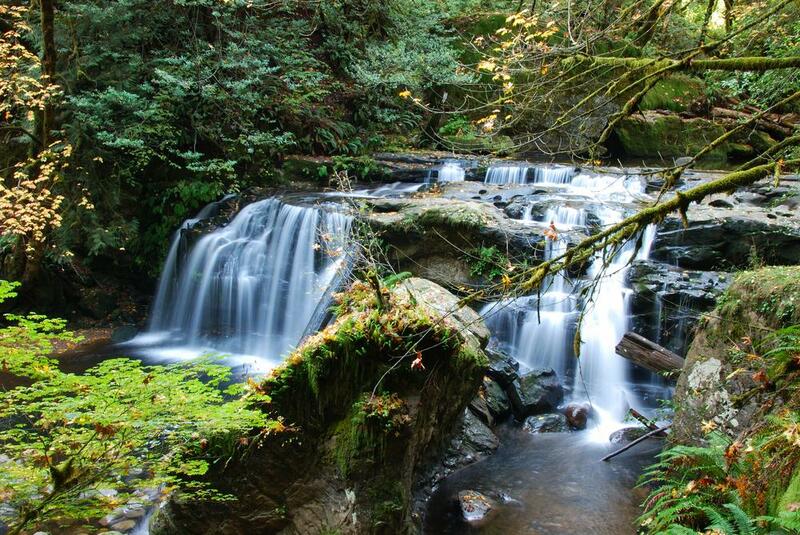 Golden and Silver Falls State Natural Area offers opportunities to hike and fish or simply soak in the solitude. Plot a course through old growth Oregon Myrtle, Big-Leaf Maple and Douglas Fir trees to find the park's two beautiful waterfalls. Enjoy incredible views and varying terrain along the Oregon Coast Bike Route, a 31-mile stretch along Cape Arago Highway and Beach Loop Road. No fish is fresher than those that you catch yourself! Enjoy a day out on the sea with Betty Kay Charters for a half or full-day of rock, tuna, salmon and halibut fishing trips, as well as bay cruises and ocean tours. For bottom feeder, salmon and halibut, be sure to stop by Bob's Sport. You can contact the company at (800) 628-9633. The Oregon Dunes National Recreation Area is the largest expanse of coastal sand dunes in North America. This unique destination in Coos Bay gives you plenty of opportunities for adventure. Wind-sculpted sand dunes tower up to 500 feet above sea level. Thousands of off-road vehicle riders come here every year to experience the thrill from riding across these expansive sand tracks. The largest riding area is between Spinreel Campground and Horsfall Road. Other exciting recreational opportunities include hiking, photography, fishing, canoeing, horseback riding and camping. The beach is open year round, so come any time to experience these amazing dunes. Spinreel offers everything you need to go on an adventure in the Oregon dunes. You can rent Quads (ATV’s), 2-Seat, or 4-Seat Vehicles and drive them yourself. Or take a tour with an experienced guide driving you. Spinreel also features Oregon’s largest and best dune-riding area. Experience the awesome windswept dunes, drive on scenic sand trails, or ride along the breathtaking Pacific Ocean beach. Steve's is a family-owned operation with over 300 ATV/UTV (dune buggies) to choose from. They specialize in ATV Rentals, ATV service, ATV parts and accessories. Steve’s is dedicated to providing you with the education and training needed to have a safe ATV riding experience. With locations all across Oregon and California, they're experts in west coast dune buggies.